Perennial pepperweed is a hardy perennial plant that can reach 6 feet in height under ideal conditions. It reproduces by seeds and from a deep, creeping root system. Basal leaves are waxy and lance-shaped on a long petiole. Stem leaves are smaller with short stalks. Leaves have a prominent white mid-vein. 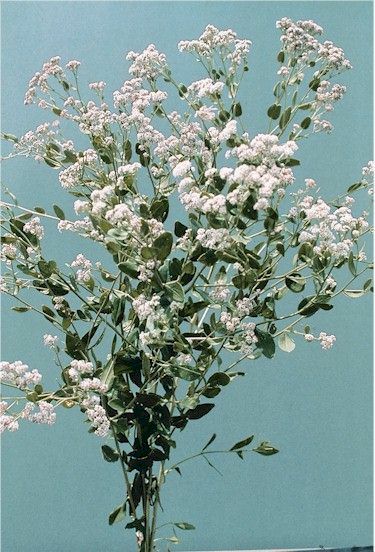 The tiny flowers have four white petals and are arranged in numerous rounded clusters on the ends of the branches. Each flat, elongated capsule produces two seeds. Type and Class of Livestock: All classes of sheep and goats. Grazing Objective: Remove 85% of top growth with repeated grazing treatments (every three to four weeks) to remove regrowth. Growth Stage for Treatment: Sheep and goats will readily consume the plants until the early flowering stage, with preference for early vegetative stages. Repeated grazing for several years will be necessary to suppress perennial pepperweed long term. Potential Effectiveness: Repeated, intensive grazing can significantly reduce perennial pepperweed biomass, density, and height in a single season, but the massive root system rapidly replenishes the infestation. Thus, grazing must be continued for several years to deplete root reserves. Results vary as to the long-term impacts of targeted grazing for plant suppression. Grazing can be combined with other herbicide spraying for long-term perennial pepperweed management. Allen, J.R., D.W. Holcombe, D.R. Hanks, M. Surian, M. McFarland, L.B. Bruce, and W. Johnson. 2001. Effects of sheep grazing and mowing on the control or containment of tall whitetop. Proceedings of the Western Section American Society of Animal Science 52:77 (Abstract). Carpinelli, M.F., C.S. Schauer, D.W. Bohnert, S.P. Hardegree, S.J. Falck and T.J. Svejcar. 2004. Effect of ruminal incubation on perennial pepperweed germination. Rangeland Ecology and Management 58:632-636. Clements, C. D., J. A. Young. 2006. The use of goat grazing to biologically suppress perennial pepperweed Available at: http://www.ars.usda.gov/research/publications/Publications.htm?seq_no_115=183198 Assessed 14 August 2006. Ryan, M., S. Donaldson, and W. Johnson. 2002. Perennial pepperweed (Lepidium latifolium) in Southern Nevada. University of Nevada, Reno. Cooperative Extension. FS-02-98 Available at: http://www.unce.unr.edu/publications/FS02/FS0298.pdf. Accessed 03 September 2006.